The sketch of Henrietta Gray (Netta) Bedinger given below was written by Davis Griffith-Cox, who has had a distinguished career as an artist, educator, writer, architectural designer, and researcher of history and genealogy. He is president and founder of the Griffith Homeplace Museum in Terrell, Texas which houses and exhibits many of the works of Henrietta Gray Bedinger. Davis is a great nephew of Netta Bedinger and the grandson of Netta Washington Morrill, a niece of Netta Bedinger. Netta Morrill, as a young girl lived with Netta Bedinger and was educated and later taught at many of the colleges at which Netta Bedinger taught. Since a young lad, Davis has been close to the art treasures of Netta Bedinger and is steeped in the legend, lore and family history of her life. Significantly, he has a lifetime of study and familiarity with the artistry of Netta Bedinger and he imparts in his sketch of Netta an unequaled depth of understanding of her work, her life, and technical insight into her work. by of the bride’s parents, John Thornton Augustine Washington and Elizabeth Conrad Bedinger. Elizabeth Conrad Bedinger was the daughter of Lt. Daniel Bedinger, the brother of Major George Michael Bedinger who was the grandfather of Solomon Singleton Bedinger. Thus, Solomon Singleton and Mildred Berry were second cousins. When Solomon Singleton and Mildred Berry were married, 8 February 1854, the parents of both were deceased and the estates of both families were being settled among the heirs. With agricultural lands opening up in the country’s western frontier, young Netta with her parents and Solomon’s brother, Henry Clay Bedinger, and several brothers and sisters of Mildred and their families set out in the spring of 1856 to establish plantations in Missouri. In a short time they became prosperous with bright futures seemingly ahead. At the outbreak of the Civil War Netta’s father and her uncle, Henry Clay Bedinger, volunteered their services to the Confederacy in Company E of the 10th Missouri Cavalry and both served until the close of the war. Mildred Berry’s sister, George Anna Washington, was married to a Union Army officer, Major John Wheeler Smith. The three sisters and their families lived together for a time while their husbands were in active service. The arrangement afforded some protection from depredations by pro-Union raiders. 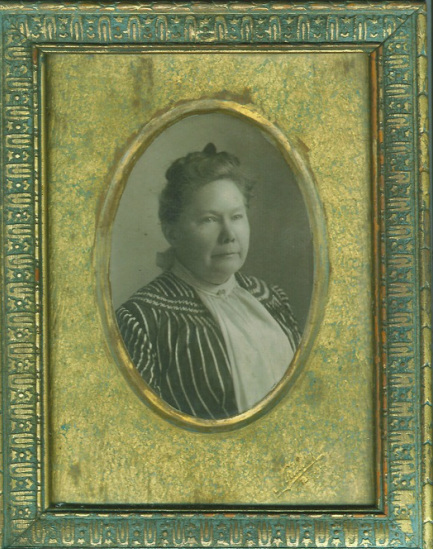 In 1858, when Netta was not yet four years of age, her maiden aunt, Sarah (Sally) Eleanor Washington died. In a show of affection and perhaps recognizing the artistic talent of her little niece, Sally provided in her will items of property for Netta. The proceeds from the property were to be accrued until Netta reached the age of 18, when it was to “… be used to send her to school and give her both useful and ornamental education”. The property willed to Netta did not survive the ravages of the Civil War. However, Netta, by her own determination, was to attain the education her aunt had wished for her. 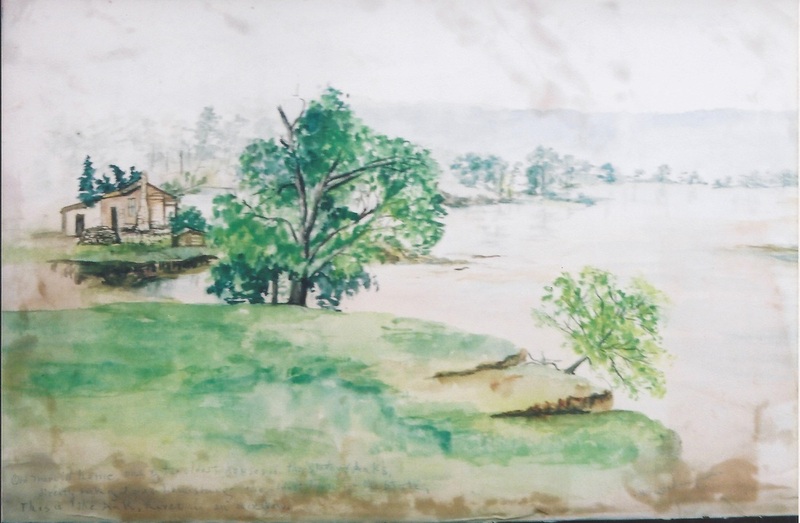 Water color painting of the Arkansas River at Lewisburg, Arkansas by Netta at age 16 years. Following the close of the war Solomon and Mildred Bedinger, having lost most of their personal estate, sold or bundled the remains and moved the family to Conway Co., Arkansas. Early on Netta showed a gift for art which is reflected in her renderings of scenes near their home in Arkansas. The family's few prosperous years in Arkansas were followed by the death of their youngest son Arthur Singleton. Netta’s mother died in 1871 at the birth of her fifth child, Singleton Berry, and her father died scarcely a year later, succumbing, it is said, to latent wounds he suffered during the war. After the deaths of Solomon Singleton Bedinger in and his wife Mildred Berry Washington Bedinger, it was left to Netta, the oldest daughter at the age of 17, to hold the family together. She and her younger sister Lavinia, then 15, cared for the infant, Singleton Berry, and the young son, Henry Clay, age 13. Henrietta maintained the homestead near Lewisburg. In 1875, the homestead was proved and title of the homestead was vested with Henrietta, her sister and two brothers. To keep the family together Netta may have taught school in the early years after her father’s death. Under her care her siblings grew and thrived. Her sister Lavinia obtained her teaching license in 1878. In 1882 Lavinia married E. H. Morrill, son of a leading merchant of the nearby town of Morrilton. Brother Henry Clay left the family group in his teens to seek his fortune. Later, Netta worked as a stenographer in the Arkansas State Legislature. Despite legal and financial, Netta managed to save enough to go to St. Louis where she attended for three years the St. Louis School of Fine Arts, at Washington University. She studied with outstanding and well-known artists including: G.W.Chambers, John Fry, Paul E. Harney, and Carl Gutherz, in St. Louis, and later, F.B. Aulich, and D.M. Campana, at the Chicago Art Institute, among others. Netta subsequently accepted her first teaching position at the college in Winfield, Kansas at The Kansas Industrial Institute, later the University of Kansas, where she stayed about a year before going on to The University of Arkansas where Gen. D.H. Hill was President. He knew both Netta and her family and having followed her career had written, offering her a position at the university where she could be closer to home. She accepted the job, where during her three years there she established the art department. Two excellent examples of her scissor cuttings, or scherenschnitte, done during her tenure at the University of Arkansas are housed in their Sue H. Walker Collection at the university. General Hill wrote a letter of recommending Netta for a position at Pass Christian Female Academy in Mississippi. The letter served as an excellent introduction to his friend, Confederate President Jefferson Davis who lived nearby. Netta quickly became friends with Davis and his family and taught art to his daughter, Winnie. Several watercolors dated as early as 1880 and throughout the decade show his study, his boat house, his schooner, named “The Winnie” and scenes along the beach. During her tenure at Pass Christian, Netta went to Key West and traveled along the Mississippi coast. A catalogue from the Pass Christian Institute dated 1887-88-and 89 lists Netta Bedinger among the faculty. Netta’s output of art was prodigious and some of her most creative and finest work was done while living in Pass Christian. There is a fine painting, done presumably while she was there which was said to have won first place at a world’s fair. Research has failed to produce solid proof, though it is well known that the canvas suffered minor damage in transit back to the artist after the exhibit, due to improper re-packing for transportation. It may have been exhibited in near-by New Orleans where she visited. Her name appeared there in the newspaper, The Times Picayune, and family legend says that she attended the funeral of her friend Jefferson Davis there in 1889. Forever adventurous and bold, some of her paintings depict her rowing out into the Gulf of Mexico at night, alone, to paint a small boat that was on fire and another night scene shows a young man spear fishing in shallow water. It has been noted that she would wear a wide brimmed hat to which candles were attached in order to see while recording scenes at night. She was obviously fascinated by the turbulent and ever changing sea and pictured it many times. A boat in the distance might be sinking, or a rainbow might appear above the water. We have numerous such examples in the collection at Griffith Homeplace Museum. By the winter of 1889-90 she had returned to Arkansas and was head of the art department at Hiram and Lydia College. Dated watercolors picture her there during the winter. During the decade of the 90’s Netta taught at Altus, Arkansas, Isbell College at Talladega, Alabama, at Tullahoma, Tennessee, and LaGrange Female College at Lagrange, Georgia. Several paintings from these locations along with her written resumes verify these facts. Of these, La Grange was the last before coming permanently to Texas. Netta had known the Toone family in Morrilton, Arkansas where she had lived and where her sister, Lavinia, was currently residing. The Toones, having family connections in Terrell, Texas decided to come to Terrell and developed a new college there. Netta was contacted and asked if she would establish an art department for them. Thus, she moved to Texas in 1901; she was followed the next year by her sister, Lavinia with her children, and her brother Singleton. Without changing her location, or even her class room, Netta worked at the same college which took on alternative names and ownership affiliation. First, Toone College, 1901-1903, then Terrell University School (1904-1909) followed by North Texas University (1910-1911). When the school became a military college without art instruction, she continued to teach privately from her own studio. She was always involved in the lives and care of her nieces and nephews and the number was ever increasing as her niece had now married and was living next door and would eventually have seven children of her own. Her brother Singleton, known as Som, had five children and lived a few short blocks away. Thus, once again she was surrounded by family. 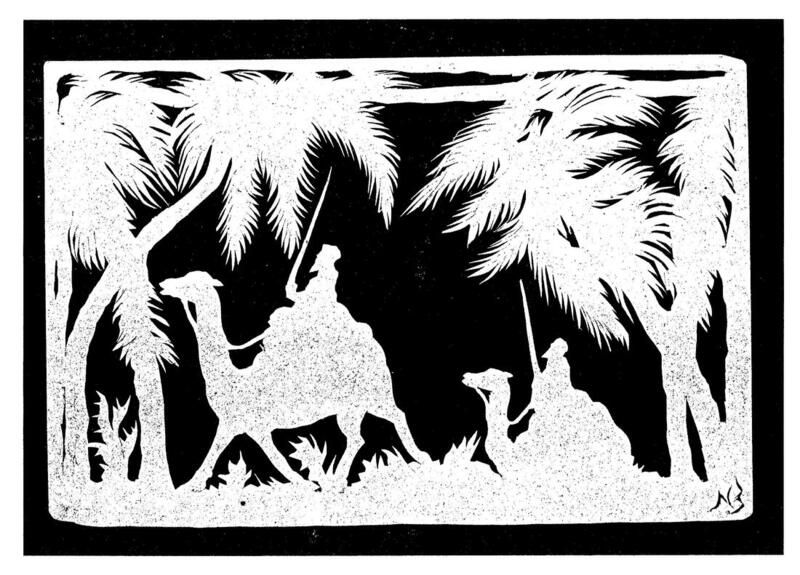 Verified documentation shows that Netta exhibited at least four works at the St. Louis World’s Fair in 1904 and that she began writing children’s stories and poetry which was lavishly illustrated. There was intent to publish, as typed copy along with attached art and publishing notations exist. There is no indication that these were printed. 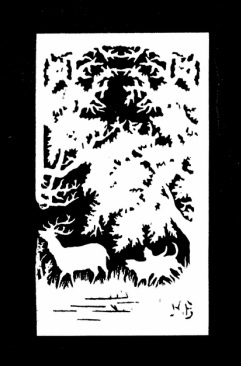 A single work entitled “The Blue Jay Co.” tells a children’s tale which was written for her nieces and contains multiple examples of her scissor cuttings. Records during the First World War show and list a half dozen scissor cuttings that were copyrighted in 1916. These were reproduced by her brother who owned Dallas Novelty Company. 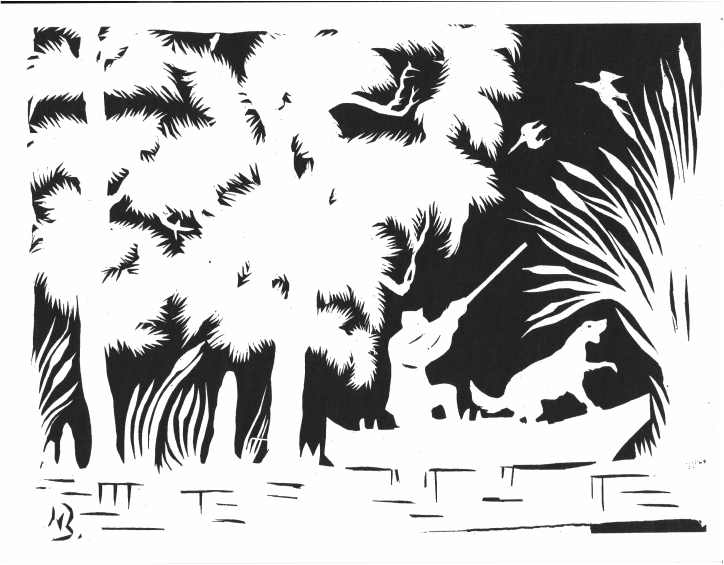 A paper attached states that each original was cut completely by hand without any preliminary drawing by “Miss Bedinger, a Southern artist”. Now free of her teaching obligations, Netta was again able to pursue her art more freely. She studied for an indefinite period of time, probably a few months or one semester, at the Art Institute in Chicago. In the big city she was able to go to museums and study first hand major works by the old masters as well as top rate contemporary works. This was a great advantage in terms of artistic exposure which was limited in her previous surroundings and small town environments. She knew that it took exposure and being at the right place, at the right time in order to become well known in the art world. Probably influenced and encouraged by her professors, who were aware of her extraordinary talent, she decided that she would go to Europe. Her desire was to know Morrissot and Degas. But conditions were not right once again on the world scene. She saved her money and worked hard and as she longed for a trip to France, perhaps, even thinking, if all went well, to move there. Netta packed her bags, bade her family good-by and went to New York where she planned to first explore all of the museums and ultimately book passage to Europe, according to family legend or lore. It was said by her family that she had booked passage on an ocean liner for Europe when a telegram came. It told of the sad and sudden death of her sister-in- law, her brother Singleton’s wife. With an overwhelming sense of family duty, devotion and obligation, she returned home immediately. Realizing that her brother had five young children, one of whom was really just a baby, and that he had no way of managing on his own, she gave up her studio and moved to his small home to be housekeeper for his family and to care for his children. The thousand dollars which she had managed to save over a period of three years, for the trip and subsequent life in Paris, went to her brother for family expenses including the burial of his wife. In her last will and testament Netta forgives the loan, offering it as a part of his inheritance along with several of her favorite pieces, including highly prized vase painted by Campana. Thus, in 1917 at age sixty-two she surrendered her independent lifestyle to become a surrogate mother, once again, the role which she so dutifully had assumed when her brother Singleton was a baby. After that date not a single painting or watercolor was done. There was little time between cooking, cleaning, washing clothes and helping the children with their studies. She only attempted to paint an occasional tea cup or cut out a figure of an animal to amuse one of the children. There is no indication that any art work was done. In five short years she was gone. Her death certificate in 1923, states that she died from exhaustion. A particular and sophisticated element of her personal style is the painting of background objects monochromatically and in pale tones to give an impression of greater depth and added perspective. This atmospheric illusion is called “sfumatto” and was also used at times to redirect the eye to a focal point or center of interest, especially in floral and still life compositions. She was obviously familiar with sophisticated techniques borrowed from the Japanese and adapted by some of the impressionists like Manet and Degas who were preoccupied with oriental prints. This presented somewhat of a more flat composition emphasizing design and using alternative techniques to show a depth of field. She played constantly with atmospheric effects, seen in her later works. The effect is especially evident in a composition of ducks which are piled up after the kill and appear on the edge of a bank covered with cattails and surrounded by a pond. An earlier work using similar subject matter with the days kill simply propped against a log, which is likewise supporting a shotgun, has none of the dramatic lighting, the sunset and enigmatic quality evident in the later painting. Another small canvas shows deer who have come down to a lake to drink in the early hours just at dawn while there is still fog in the morning air and steam is rising from the water. This composition is very high key and value relationships are close, the colors grayed and pale. The work is a museum quality gem and fortunately a part of the permanent Historic Griffith Collection for our museum. During her time studying, both first in St. Louis in her early years, and much later, circa 1914, at the close of her formal college teaching when she studied in Chicago, she had ample time for going to major museums. Here she found not only works of the old masters, but also work of her contemporaries. She was especially fascinated with the work of several artists who lived in Europe. Most probably at the urging of her teachers, several of whom had studied there themselves, she set a goal: to save her money and go to Europe in hope of meeting some of the better known artists. Her teachers knew personally some of the important figures in the art world and it is most likely that she was given letters of introduction and possibly corresponded with one or more of them. The planned trip and its ultimate failure to materialize, as aforementioned, altered the course of the remainder of her life. But, it is interesting to speculate what might have happened if she had ultimately settled in Paris. Perhaps being in the right place and with the right gallery managers and agents, the name of N.G. Bedinger would be well known in the art world of today.